LANSING, Mich. — Taiwanese electronics maker Foxconn’s plan to build a display panel factory in the U.S. has sparked a flurry of lobbying by states vying to land what some economic development officials say is a once-in-a-generation prize. It’s not just jobs that are up for grabs — possibly 5,000 alone at the plant and potentially thousands more at other unspecified U.S. operations the company intends to launch. Luring Foxconn to build the country’s first liquid-crystal display factory would signal that the Midwest, which has hemorrhaged manufacturing jobs in recent decades, can diversify into again producing high-tech consumer gadgets often assembled in Asia. The hunt for Foxconn is fluid and largely secretive, with Rust Belt governors and state officials declining to even confirm their interest due to non-disclosure agreements and Foxconn not elaborating much on why it will expand its U.S. footprint. But Foxconn, the biggest contract assembler of smartphones and other devices for Apple and other brands, has listed seven states with which it hopes to work. It’s expected to announce plans to develop operations in at least three states by early August. In two, the wooing of Foxconn has spilled into public view. Michigan lawmakers this month passed job-creation tax incentives, including one for companies that add at least 3,000 jobs that pay the average regional wage. Wisconsin legislators are considering new incentives, too. WISCONSIN: Republican Gov. Scott Walker has close ties to the White House, and President Donald Trump said during a visit to Wisconsin that “we were negotiating with a major, major incredible manufacturer of phones and computers and televisions and I think they’re going to give the governor a very happy surprise very soon.” House Speaker Paul Ryan met with Foxconn officials and hopes the company will build its big plant in his southeastern Wisconsin district, which isn’t far from Chicago. Right-to-work Wisconsin has a manufacturing incentive that provides a dollar-for-dollar tax credit equal to 7.5 percent of reported income, nearly eliminating all corporate tax liability. Like some other states, it struggles to provide enough trained workers for available jobs. MICHIGAN: Republican Gov. Rick Snyder has made Michigan more business-friendly by slashing business taxes, eliminating a machinery tax and boosting trades training. The auto state boasts the most engineers, per capita, and tax changes and loosened union requirements help it compete. But a decision to reduce tax incentives has kept it out of the mix for large-scale business expansions, say economic developers. The new “Good Jobs” incentives worth $200 million annually will let qualified companies keep employees’ state income tax withholdings for 10 years. High electricity rates may be a hindrance, and some lawmakers have criticized the working conditions at Foxconn’s factories in China. 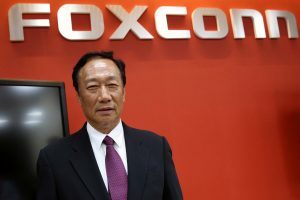 PENNSYLVANIA: In January, Foxconn Chairman Terry Gou said Pennsylvania was a leading candidate for the factory, but that the company was also in discussions with other states. Gou’s talk of hiring 50,000 workers for all of the company’s U.S. operations has been met with some skepticism because the state’s 2013 announcement that Foxconn would add 500 jobs at a high-tech manufacturing facility in Pennsylvania hasn’t panned out. Democratic Gov. Tom Wolf touts the state’s low energy costs, major shipping ports and proximity to six of the 10 largest U.S. markets. Pennsylvania has an existing $1,000 tax credit per job created, but its corporate tax is high compared to those in other states. Business groups say it’s difficult to find skilled workers in Pennsylvania and the state can be slow in issuing permits. OHIO: Like other states, Ohio hasn’t publicly disclosed any incentives it might offer Foxconn. Republican Gov. John Kasich made a hastily arranged trip to Japan in early June to pursue undisclosed business opportunities — the same weekend the governors of Wisconsin and Michigan were also there. Kasich hypes an improved business climate that includes the elimination of corporate income taxes and tangible personal property taxes on businesses, regulatory streamlining, and extensive higher education and workforce training networks. Despite recent economic improvements, Ohio was forced to close a projected $1 billion budget gap last month. INDIANA: Republicans crow about cuts to the corporate tax rate and a favorable regulatory climate. But perhaps the biggest advantage Indiana offers is its central location, a recent $4.7 billion investment in infrastructure and comparatively low wages. Republican Gov. Eric Holcomb and other governors have generally been willing to push generous tax incentive packages. The right-to-work state in 2015 passed a religious objections law that critics contended would allow business owners to discriminate against gay people. A backlash, including from big business, prompted legislators to change it, but Indiana took a big public relations hit and the episode remains a black eye. ILLINOIS: Illinois has no tax incentive program, but lawmakers hope to adopt one soon that would be similar to one the state used to have and would give tax breaks for creating and retaining jobs. Illinois has a central geographic location and an enviable transportation network, with international access by air from Chicago airports, a solid rail network and water access to both the Atlantic Ocean and the Gulf of Mexico. The state’s finances, however, are a mess. After two years without a state budget due to an impasse between Republican Gov. Bruce Rauner and the Democratic-led Legislature, legislators finally passed one this month by overriding the governor’s vetoes. It included increases in the income and corporate taxes. TEXAS: Republican Gov. Greg Abbott can offer incentives to job creators. Texas is about as pro-business as they come. After the Great Recession, Texas led the nation in economic growth, though it has fallen back due to the prolonged slump in oil prices. Former Gov. Rick Perry relished traveling to recruit major employers to Texas, even if it meant stealing jobs from other states. His successor, Abbott, has made fewer such trips but has aggressively continued Perry’s “Texas is open for business” pitch to top companies. Its Sun Belt location used to be a plus, but Texas has been punished by droughts in recent years. Meanwhile, the Republican-controlled Legislature has begun embracing policies backed by social conservatives that top companies say is bad for business. Associated Press writers Scott Bauer in Madison, Wisconsin; John O’Connor in Springfield, Illinois; Mark Scolforo and Marc Levy in Harrisburg, Pennslyvania; Brian Slodysko in Indianapolis; Julie Carr Smyth in Columbus, Ohio; and Will Weissert in Austin, Texas contributed to this report.